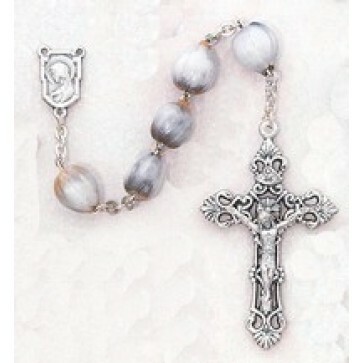 The droplet-shaped, pearly white beads of the Job's Tears Rosary give the unique design its notable name. The beads resemble the tears shed by the biblical man of the Old Testament who endured great suffering in his time. Some people believe the tears are from other biblical figures including David, Mary or even Christ. Because of this, the rosary is sometimes referred to as David's tears, Saint Mary's tears or Christ's tears. Regardless of what you call it, the rosary is stunning with a beautiful filagree crucifix and Blessed Mother center piece.